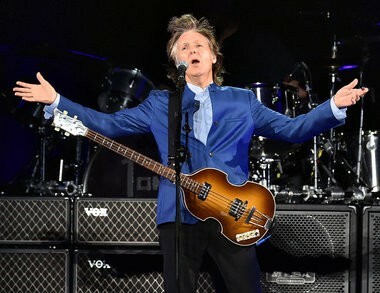 SYRACUSE, N.Y. — Apart from Syracuse’s long-awaited visit from music royalty, concertgoers may remember Saturday, Sept. 23 as the night Paul McCartney almost burned down the Carrier Dome.OK, that’s a little dramatic. But the singer’s pyrotechnic effects for “Live and Let Die” literally set aflame the steel bars atop the righthand side of the stage. The blaze only licked a couple feet upward, but that was high enough under the Teflon-coated dometop for fans to point and panic a little.A Dome staffer scampered up the side-stage ladder to swat the fire into submission, showering the stage below with glowing sparks. Several first-responders quickly blasted the embers with fire extinguishers while McCartney happily played “Hey Jude.”Oh, and the music sizzled too. Two of the greatest songwriters of the last century visited Syracuse within the last few months: McCartney and Bob Dylan. This review won’t compare both shows. They’re purposefully different performers and people. But while McCartney, 75, is just one year younger than Dylan, he might as well be half his age.And unlike the grumpy, detached Dylan, the playful, animated McCartney seemed sincerely happy to be in the Carrier Dome, which he knows from seeing “many basketball matches” there.Those little touches meant a lot to this crowd. The fans knew they were seeing a living legend at the Dome, who didn’t need to care about Syracuse or personalize his set for anyone. But he did. He joked about his hometown of Liverpool (“Not the Liverpool here,” he smirked. “The other one.”) and read aloud from fans’ homemade signs.Both fans and security staffers helped one man and his mom inch near the stage, thanks to their sign: “IT’S MY B-DAY 9-23-39.” People cheered as the 78-year-old danced along to “Sgt. Pepper” and McCartney did some rump-shaking of his own on “And I Love Her.”The former Beatle played a three-hour set, sparing only a five-minute break between his main set and encore. That’s 32 songs straight of singing, while playing bass, guitar, piano or ukulele. 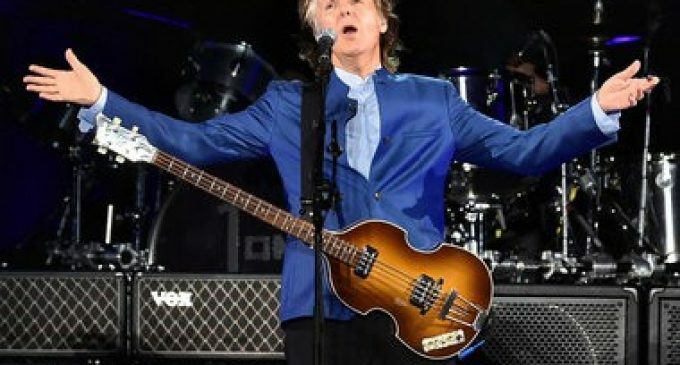 Either McCartney is exactly the global treasure we don’t deserve, or he’s a freaking robot with no off-switch.Of course, the acclaimed singer/songwriter possesses one of the largest catalogs in music history and the determination to perform as much as possible. A big reason for McCartney’s endurance is his utterly transcendent band. Unlike the laid-back (though forever groovy) Ringo Starr, drummer Abe Laboriel, Jr. brought monstrous ferocity to “Helter Skelter” and “Band on the Run,” plus a killer voice to boot. Laboriel does indeed “ghost” on many high notes. McCartney sings all his lyrics, but winces and cracks a bit in the upper register, especially on slower-paced tunes like “Let Me Roll It.” Still, he never sounds strained because Laboriel’s sturdy tones fill out his thinner pitches.ADVERTISINGAnd those notes are not easy. Laboriel worked hard on Saturday night, sweating, singing and pounding relentlessly on the drums. When he lifted up a much-deserved glass of red wine before the encore, he drew one of the loudest cheers yet from the Dome crowd.Meanwhile, Wix Wickens performed jaw-dropping aural wizardry on his keyboard computer, between masterful takes on the accordion and harmonica. And axemen Brian Ray and Rusty Anderson proved exactly why they earned the coveted spots next to Paul, where the late John and “Georgie” once stood.Anderson especially charmed the crowd with romantic acoustic flourishes on “My Valentine,” a haunting piano ballad written for McCartney’s wife Nancy Shevell. He, Ray and McCartney superbly powered through the ultimate encore trio of “Golden Slumbers,” “Carry That Weight” and “The End,” before confetti cannons played them off.Beatles’ final concert recreated on Syracuse rooftop in honor of Paul McCartney visit (video)Beatles’ final concert recreated on Syracuse rooftop in honor of Paul McCartney visit (video)McCartney will finally “Get Back” to Syracuse after postponing his 1993 show.The “One on One” tour makes a valiant effort to introduce honest intimacy into McCartney’s arena shows, especially with his many tales of the trade. He’s a gleeful storyteller — grandfatherly, with a touch of delightful wickedness, like he can’t believe he’s still getting away with this crazy life he has.This was the only show in 2017 where I both laughed and cried. McCartney regaled the crowd of 35,000+ people with both funny and heartbreaking stories of watching Jimi Hendrix ruin a guitar, meeting the Soviet Union’s defense minister and writing “Here Today” after losing John Lennon.